Advocacy Support. New England Hearing Loop supports those with hearing loss. 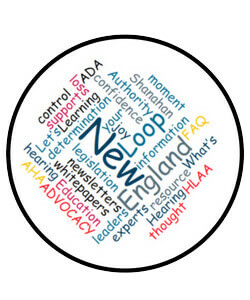 New England Hearing Loop is committed to providing education, information, and advocacy support to people living with hearing loss. Awareness of this epidemic is a silent issue. Everyday more and more people of all ages suffer from this growing problem. We are here to help. Active in our local, regional and national communities we support, endorse and participate in hearing loop events, demonstrations, conferences and charity campaigns. We believe awareness is key in advancing hearing initiatives. Here you’ll find information from various hearing loop industry leaders and advocates along with national legislative directives plus local resources. For the latest hearing loop news and happenings check out our blog Loop & Listen.